We’re really big fans of the Joyetech Cubis Tank, mainly because of its ease-of-use and awesome LEAK-PROOF design. It has 3.5ml of capacity with adjustable airflow, and it’s tighter draw is perfect for mouth-to-lung style vaping. The tank comes with 0.5 and 1.0 ohm stainless steel heads, along with a 1.5 ohm clapton. 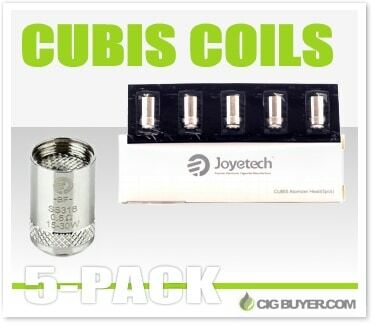 Each Cubis coil features protective spitback mesh, organic cotton, and a vertical coil orientation. In addition, 0.2 ohm Ni200 and 0.4 ohm Ti replacement heads are available for temperature control.